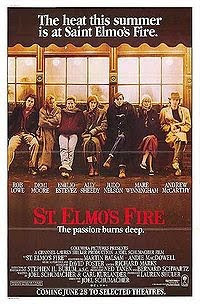 The classic 1980s right-of-passage movie St. Elmo's Fire (movie poster pictured left), about a group of seven friends trying to make their way in the world after graduating college, will be turned into a TV series for ABC. The show will focus on the same topics as the film and, like the movie, will be set in the St. Elmo's Bar & Restaurant. Executive Producer Dan Bucatinsky says, "I feel it is time to re-create Friends in the hour-long genre and feel like this is the perfect opportunity." According to Variety, execs plan to cast a group of unknown actors in the main roles.